There is a soundtrack to our lives; songs that recall important events or perfectly express a moment too big to understand. The songs can be full of joy, confusion, and heartbreak. 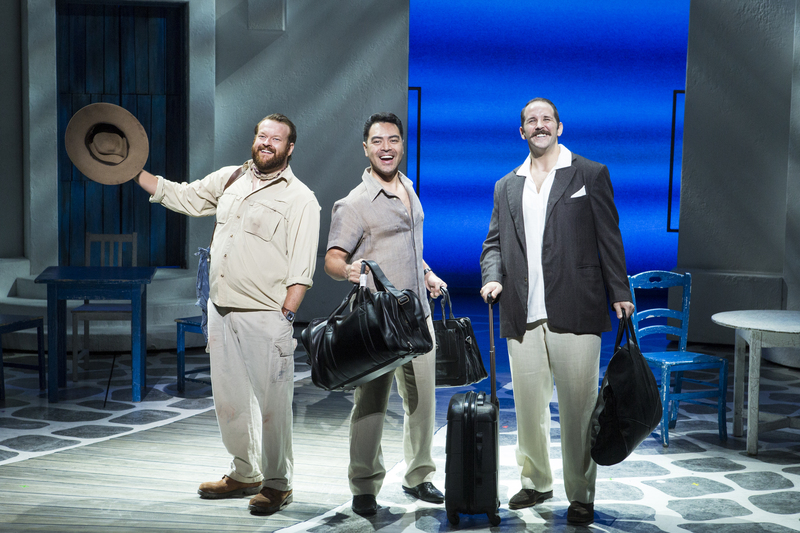 “Mama Mia” is a big ball of fun, with unexpected scenes of comedy and tenderness. It is full of infectious energy, great costumes, and toe-tapping, hand-clapping songs. “Mama Mia” is the antidote to the cold, crazy winter and the soundtrack will be playing in the audience’s head long after the curtain drops. Set to the immortal songs of 70’s Swedish pop band, Abba, “Mama Mia” is a mother-daughter story revolving around parenting, absent fathers, and the support of friends. Sophie (a charming Lizzie Markson) is planning her wedding to Sky (Dustin Harris Smith). Sophie was raised by single mom, Donna (the wonderful Betsy Padamonsky), who runs a hotel on a Greek island. Sophie does not know the identity of her father and discovers in her mother’s diary that he may be one of three guys her mom romanced back in the 70’s. So, she invites all three gentlemen to her wedding with the hope that she will find out which is daddy. However, the men are clueless to the real motive behind the invitation. Sam (Shai Yammanee), Harry (Andrew Tebo), and Bill (Marc Cornes) arrive with the hope of seeing Donna again and perhaps engage in a bit of nostalgia. Needless to say, the wedding and the unexpected guests sends a shocked Donna in a tizzy. Also along for the festivities are Donna’s ribald friends from her crazy youth, Tanya (Cashelle Butler) and Rosie (Sarah Smith). Their antics intrigue the men, young and … older. The cast is marvelous- great singing, exuberant, full of love and mischief. The rest of the ensemble is also wonderfully high-spirited. The dance numbers are a lovely mix of Greek, 70’s pop band, and hilarious sketches of levity. The sets are perfectly simple and elegant with the look and feel of a Greek island hotel. The costumes are deliciously and deliriously over the top, especially when Donna and her friends take the stage as a singing trio. It is remarkable how certain songs, even bands, can mark a life. Abba’s songs bring the happy times no matter what year or generation. Joy never goes out of style.